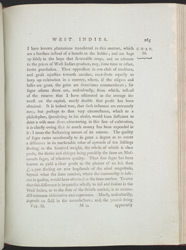 Extract from volume two of Bryan Edwards' 'The History, Civil and Commercial, of the British Colonies in the West Indies.' Edwards describes the risks involved in purchasing a sugar plantation in Jamaica, using as an example an estate worth £30,000 that produces about 200 hogsheads of sugar. He details the capital necessary to purchase such an estate, the breakdown of land, buildings and stock, the number of slaves required, the taxes imposed on land and stock, and the quantity of work involved in raising the crop.